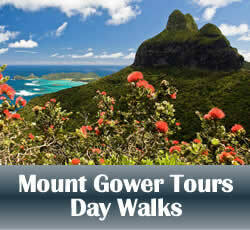 Enjoy a day with Jack Shick climbing Mt Gower on Lord Howe Island, rated one of Australia's twenty best day walks. Jack is a fifth generation Islander and third generation mountain guide, following in the foot steps of his Grandfather and Father. 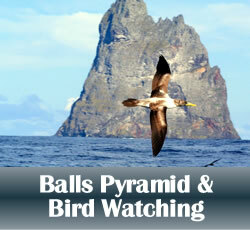 Jack is the most experienced guide on Lord Howe Island with a total of more than 1800 guided trips to the summit. Jack has been a mountain guide for 20 years. There is no one on Lord Howe Island more experienced to guide you on an unforgettable day. 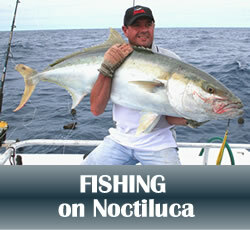 Experience breathtaking views, see some of the Islands rarest plants and bird life. All walkers receive a free certificate to commemorate the trip. Souvenir t-shirts, photo discs and a DVD of the climb are for sale. Mt Gower is an iconic peak at the southern end of Lord Howe Island, rising 875m from sea level. Considered a medium to hard trek. The walk is around 14km return and takes about 8.5 hours to complete, so you need to be in good health and have no knee or back problems. The walks are scheduled for every Monday and Thursday. BOOK AHEAD by phone or email as numbers are limited.